Summary and Definition: The Zuni were one of the Pueblo tribes who lived on the Colorado plateau and by the Rio Grande. The ancestors of the Zuni tribe were the ancient Cliff Dwellers. The Zuni tribe are a peaceful people famous for their religious traditions that encompassed the Kivas, Kachinas and many ancient ceremonial dances and rituals. The ancestors of the Zuni tribe were from the Anasazi culture who were builders of the ancient cliff dwellings found in the canyons of the Southwest, principally on the tributaries of the Rio Grande and the Colorado River. Access to the cliffs was very difficult and offered a natural defence against nomadic predatory tribes such as the Navajo and the intrusion of the Europeans. The cliff dwellers were great farmers who planted crops in the river valleys below their high cliff houses. These ancient people were experts at irrigating the fields. 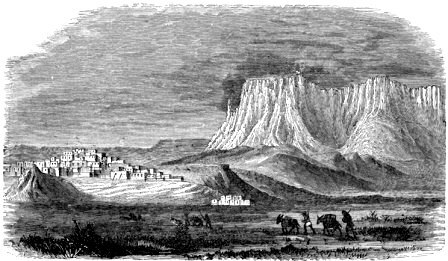 The lives of the cliff dwellers were organized on a communal basis, and the many kivas demonstrate that their religious ceremonies were like those of the Pueblo nation and the Zuni tribe of today. What was the lifestyle and culture of the Zuni tribe? The Zuni tribe are a peaceful people and one of the major Pueblo tribes that inhabited the Southwest. The Zuni tribe have kept their culture intact due to living in such isolated areas. The Zuni villages consisted of multi-story adobe houses. The Zuni men played the dominant role in Zuni village life and were the spiritual leaders in charge of religious ceremonies and rituals. The Zuni men were also the political leaders of the tribe. The role of the women was concentrated on the home. The Zuni tribe became noted as excellent agriculturalists, stockbreeders and skilled weavers, potters, and silversmiths. Where did the Zuni tribe live? The Zuni are people of the Southwest Native American cultural group. The location of their tribal homelands are shown on the map. The geography of the region in which they lived dictated the lifestyle and culture of the Zuni tribe. 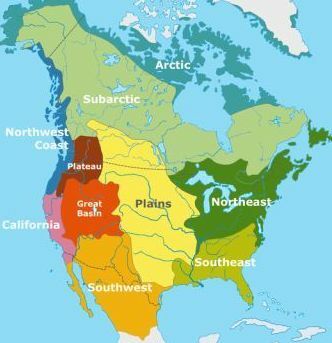 They lived in the American southwest desert regions in the states of Arizona, New Mexico, and Texas. What did the Zuni tribe live in? The Zuni tribe lived in villages located near the isolated ancestral homes of the Cliff Dwellers. The picture provides an excellent illustration of a typical Zuni village with their multi-story adobe houses in the vicinity of great cliffs with Zuni farmers working in the nearby fields. The Zuni homes were made of adobe from a mixture of clay and straw baked into hard bricks. Each adobe was the home of one family and often contained several rooms. A feature of every Zuni village is the underground chamber used for tribal ceremonies and rituals called a Kiva. A Kiva is a special sacred building, built underground, that consisted of circular underground chambers entered through a hatchway on top. A Kiva is the sacred domain of the Zuni men and spiritual leaders used for secret rites and spiritual ceremonies that are strongly associated with the Kachina belief system. Prayer Sticks, or 'Pahos', were prepared in the Kivas for calling forth spirits in the evocation of a prayer. During these sacred rituals masks and costumes were worn to impersonate kachinas (ancestral spirits). What is the religion and the beliefs of the Zuni tribe? The principal figure in the Zuni creation myth is "Awonawilona, the maker of all" in which the the origin of the sun, the earth and the sky, men and all creatures are explained. The creation myth speaks of the long journey from the lowest of the four caves of the world to light and life on present earth. The Zuni tribe are strongly associated with Kachina dolls. The Kachinas represent the powerful spirits of deities, animals or natural elements who can use their magical powers for the good and well-being of the Zuni tribe, bringing rain, fertility, healing and protection to the people. Each of the Kachinas hold different powers. Kokopelli is the most famous of all the Kachina spirits. The Soyal Solstice Ceremony is a major Zuni ceremony which is celebrated over a period of 16 days. What language did the Zuni tribe speak? The Zuni tribe spoke in the their own Zuni language. What did the Zuni tribe eat? The food that the Zuni tribe ate included included meat obtained by the men who hunted deer, small game and turkeys. As farmers the Zuni Tribe produced crops of corn, beans, sunflower seeds and squash. Crops and meat were supplemented by nuts, berries and fruits such as melon. Later the Zuni tribe started to raise sheep and goats. The Zuni tribe often traded their produce with the nomadic Native American Indians that lived in the Southwest. What weapons did the Zuni use? The weapons used by the Zuni tribe at first included an ancient spear throwing weapon called and Atlatl which was later replaced by the bow and arrow. The Atlatl was a type of Spear thrower or 'throwing stick' used to propel spears or "darts". The tribe also used different kinds of knives for practical purposes and hunting. What clothes did the Zuni men wear? The clothes worn by the men of the Zuni Tribe included breechcloths, short kilts, which were made from a long rectangular piece of animal skin or cloth which was worn between the legs and tucked over a belt. During the 1800's the men started to wear cotton tunics with a leather belt fastened around the waist. They wore moccasins made of soft leather - a soft, light beige, slip-on shoe, consisting of a sole and sides made of one piece of leather. The traditional headdress worn by the Zuni men were simple cloth or leather headbands although Zuni dancers sometimes wore painted masks or crowns of feathers. What clothes do the Zuni women wear? The type of clothes worn by the women of the Hopi tribe were shifts worn beneath ankle-length cotton dresses called mantas. Hair was kept long and worn in a traditional chongo style with a hair knot called a H�msoma which was wrapped in white yarn. Like all women they liked jewelry, especially elaborate necklaces which were made from turquoise and silver. Who were the most famous leaders and chiefs of the Zuni tribe? The most famous leaders and chiefs of the Zuni tribe included Chief Paliwahtiwa. Zuni History: What happened to the Zuni tribe? The Spanish first encountered the Zuni tribe as early as 1539. In 1610 the Spanish founded Santa Fe, and put all the Pueblos under their authority and attempted to suppress their religion. This led to the Pueblo Revolt (1680-1692), located in New Mexico and Arizona. 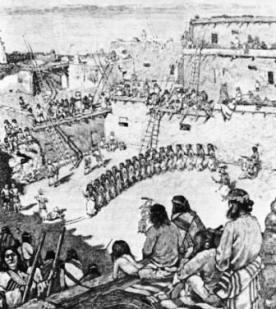 The Peublo Revolt was motivated by Chief Pop� who led a coalition of the Pueblo, Zuni, and Hopi people against the Spanish. The conflict was a huge victory for the Pueblo nation and forced the Spanish to withdraw from Santa Fe, but the Spanish eventually re-conquered the lands in 1692. Following the Pueblo revolt the Spanish relaxed the rigor of their rule over the Pueblos. During this period, the Pueblo nation became the first Native America Indians to acquire horses. Horses spread to the plains where their introduction profoundly affected the native way of life. Many of the Zuni pueblo villages survive from early times, although some ancient villages were abandoned due to attacks by the war-like Apache, Comanche, and Navaho tribes.